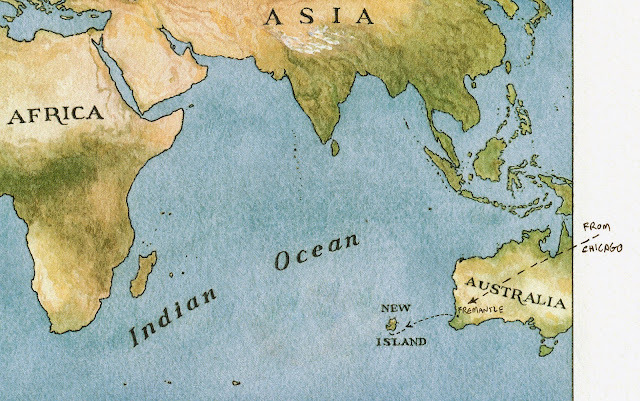 A steward with dreadlocks showed Alan to his cabin, a nice one on the main deck with a generous ocean view. Alan was unsure about sea travel, having never done it before, and hoped he wouldn't get seasick. The steward showed Alan all the details of his accommodation, such as how to flush the 'ead. (Oh, the toilet, Alan realized.) "Mealtimes", the steward explained, "are announced by a series of bells: two bells, rung three times, announce breakfast; three bells (rung twice) are the call for lunch, and four bells (rung twice) announce supper. A loud buzzer, by contrast, will announce various emergencies such as a fire, man overboard, or taking on water. Got all that?" Alan nodded as the steward pointed to the chart for all that on the door. "On a lighter note," he continued, "on almost every trip a few passengers do the drums and play guitars in the evening, out aft of the outdoor cantina....quite spontaneous, and sometimes there's the dancing. It's become a kind of tradition. Yer welcome to join us..."
Alan sat down on his bunk. Now that was nice, he thought, but he wasn't sure he'd venture it...the music that is. He then began to wonder what the ticket-lady meant when she said "Glad you made it." Did she hug everyone coming through there? It left him with a good-feeling, that he was wanted, appreciated, but also mystified. He looked around and began to notice his cabin. He admired the carved-wood sideboard on his bunk to prevent his rolling off in rough seas, he figured. He continued to sit there, not thinking much about anything, just looked around his little room. He liked the well-worn varnished mahogany, the heavy white paint on the steel walls, the functional brass hardware. It was all of such practical design, he thought, and this felt good, too. Alan heard a long deep horn blast - and then the shed outside his window slowly began to glide by. Soon after that, four bells sounded and Alan went off to search for the dining room. Fremantle, Western Australia. He has trouble believing he has come so far! Alan showed his ticket to board the SS Charles Ames to the concierge at the Orient Hotel. The smart-looking young woman studied it, front and back, scratched her head, and and gave it back to Alan, saying she'd never heard of this shipping company, or, for that matter, the destination on the ticket! 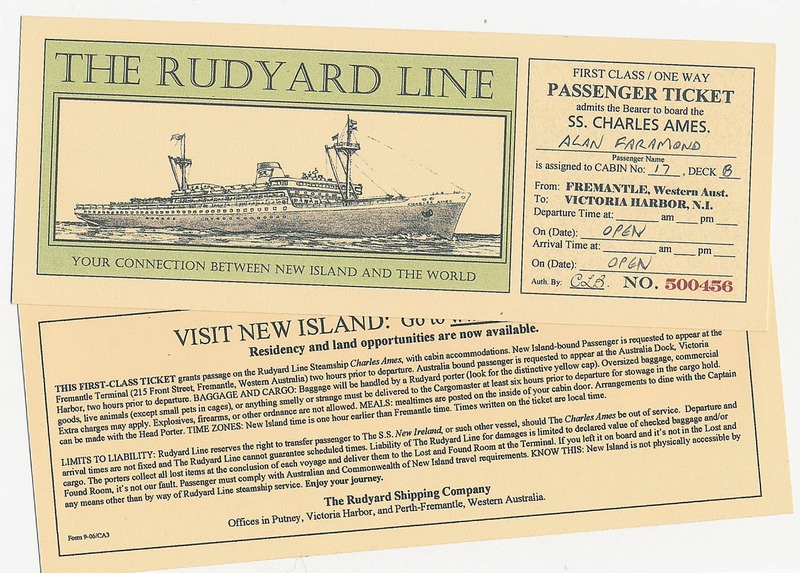 Unfortunately, there was no Fremantle street address on the back of the ticket, so Alan found a taxi out front and asked the driver to get him to the Rudyard Shipping terminal or offices or whatever... The taxi driver was Malaysian, with a thick Aussie accent, so all Alan could do was ask him to just drive around. After about ten minutes, Alan saw this little building and shouted "Stop!" "Okay", he thought, "I guess this must be it." The cabbie looked around, confused, and asked, "You want off here, mate?" 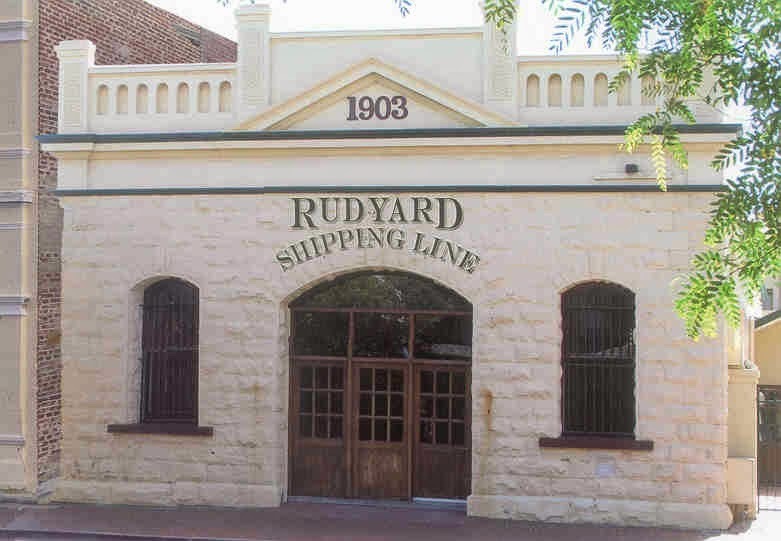 "Oh, yes - this is the Rudyard Lines shipping office, see?" "Okaaay, mon, whatever you say..." The cabbie apparently saw nothing. Alan retrieved his bag and backpack, and the cabbie graciously accepted a hefty fare in Alan's US dollars. (He hadn't yet changed any money, and then there was the tip, but still...) As Alan approached the heavy-looking wooden doors, he noticed the neighborhood seemed eerily quiet for the location of an international passenger terminal. He opened the door and stepped inside. The interior was dim, dusty and very quiet. There were a few faded "Visit New Island" posters on the walls, a row of lovely old waiting-room chairs, some vending machines next to a pay phone, and a long wooden check-in counter. He showed his ticket to an older lady who came to the counter. She stamped it, and asked, "Any Baggage?" and Alan showed his one bag, and pointed to his backpack. "Change your currency?" Oh yes, Alan thought, and pulled out his wallet, and traded his 1100 US dollars for about 49 rogers. She didn't even ask to see his passport. Then she looked at him closely - seemed to study his face, making Alan instantly nervous. He fought his usual impulse to look away whenever he was scrutinized like this, but a tiny voice within said hold your ground. Then her eyes softened and she almost smiled, as if he passed some kind of test. "OK, follow me"(she wasn't a chatty sort). They went out the back of the building and she mounted a pedicab with two back seats. She told Alan to toss his bags in the back and then climb aboard, and she proceeded to pedal them to "D" Shed in Fremantle's inner harbor, about four blocks away. And there was the Charles Ames, an older-looking passenger-freighter, all white with only a few rust stains, its forward crane still taking on cargo. Alan, amazed at the strength in her legs, tipped the lady. She smiled broadly this time, gave him a hug (which surprised him) and then said into his ear "Glad you made it!" Alan, flustered but happy in a strange way, whispered back, "Thanks", and walked up the gangway. He found the bursar and showed him his ticket. The boat was to leave in about two hours. "Wow, how easy was that," Alan thought. He was on his way. 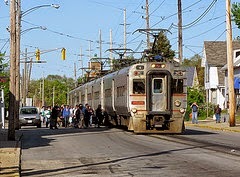 At 8:43 am that morning, Alan boarded the South Shore train at the 11th Street stop in Michigan City. He had to wait on the sidewalk - there wasn't really a station there. In downtown Chicago, He connected with a Metra train that took him to O'hare International Airport. He had to use his own money to get to O'hare, but he had his tickets from the New Island Ministry of Trade for the rest of the trip. In Terminal 1 he boarded a Qantas flight at 3:30 pm bound for Perth, Western Australia. Almost 33 hours later, after stops in Los Angeles and Melbourne, he arrived in Perth about 2:10 in the afternoon, and Alan didn't know what day it was. 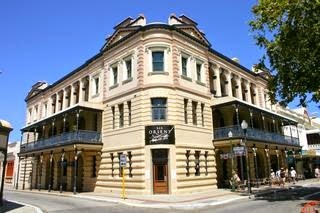 From the airport in Perth, he took a taxi to Fremantle, where he had a voucher for the Orient Hotel on the corner of Henry and High Streets. After spending a lovely and very restful night at the Orient (the corner suite, third floor), Alan had a leisurely breakfast, and then inquired about directions to the Rudyard Line office. The concierge smiled, and with a kind of blank look, replied, "The who"?